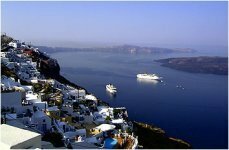 Santorini, officially named Thira, belongs to the Cyclades Island cluster in the Aegean Sea. It is one of the most popular Greek islands due to the diversity of the characteristics it possesses such as its magical aura, cosmopolitan nightlife, natural beauty, traditional architecture, archaeological sites and friendly inhabitants, a combination that makes Santorini one of the most interesting tourist resorts. Santorini's violent volcanic history is visible everywhere you look. The island is a crescent shape surrounding the black volcanic islands lying in the bay. What was once the island of Thira sank to the bottom of the caldera in the apocalyptic explosion around 1425 BC. The lagoon-like caldera measures 32 square miles and is 300 to 400 metres deep. In the center are Palia Kameni and Nea Kameni. The view of the Caldera and the sunset is considered one of the most exquisite vistas in the world. Santorini has many wonderful beaches, some of which are very unique due to the volcanic geology of the surrounding area. There are black sand beaches and you will be treated to plenty views of raw lava-layered cliffs that plunge into the sea. The drama of Santorini's past has as result that the island today is one of the most amazing, interesting and popular destinations in the Cyclades Island group. Capital of Santorini Island is Fira, built in the west part of the island on a 260 m height above the sea level. It offers panoramic view of the port and the volcano. Fira follows the traditional architecture of Cyclades islands with blue and white colourings that reflect the sun light and create a unique spectacle. The cobblestone pavements are burst with thousands of shops and are ideal for endless walks. In the capital you will find a big market with all kind of shops. Thousands of small cafes, restaurants and bars pop out here and there overhanging the Caldera gulf. You can enjoy your coffee, drink or meal viewing the most magnificent sunset in the world. Firostefani is a charming village built hanging on the cliffs, 700 meters north from Fira (the capital of Santorini). It's 5 Km from the Airport, 8Km from Athinios Port and 5 Km from the closest beach. Firostefani also has a very picturesque square, and a beautiful church dedicated to St. Gerasimos, that is surrounded by cypress trees. Imerovigli is a traditional village and it is the extension of Fira but is situated on a higher cliff. The name comes from the word "vigla" which means "day". In front of the village is located an enormous rock called Skaros. Until 1800, Skaros was part of the land and had a castle on it where all the administrative offices of the island were located. The village was almost totally destroyed with the earthquake of 1956, and the cliff-edge houses were abandoned but a tourist trade started up again in the 1970s. Today Imerovigli is a beautiful and quiet village and also one of the top areas in Greece for accommodation! Kamari, is a tourist hotspot situated on the southeast side of Santorini. The area is famous for its beautiful beach extends all the way to Monolithos and for its green landscape. On the beachfront you can find hotels, restaurants, bars and many shops that can please all tastes and budgets. In Kamari also, every year, the Jazz Festival takes place, in the lovely atmosphere of its outdoor cinema. The official name of the village is "Episkopi Gonia" and took its name from the interesting church of Panaghia Episkopi which was built in 1100. The picturesque village of Oia is situated high on the reddish cliff, on the northern tip of Santorini Island. Oia is renowned for its magical view of the Aegean Sea, the volcano and the sunset, attracting thousands of visitors every year and is the most picturesque settlement on Santorini. Along the cliff of Oia, houses have been delved into the porous volcanic rock. Parts of these houses are visible and the scenery that results from it is generally perceived as being typically Greek. Perissa is one of Santorini best beaches. Next to Emporio village a long dark sand endless beach. A feature that makes Perissa unique (besides the crystal water and the smooth sand) is the fact that is the best protected beach from the summer Aegean winds (called "Meltemia" in Greek). Perissa lies right next to Profitis Ilias mountain, totally protected from the North.